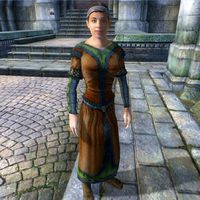 Astinia Atius, an Imperial commoner, lives in the Talos Plaza District of the Imperial City. Astinia's family, the Atius clan, is in a dispute with the Sintav clan, but Astinia wants nothing to do with it. Her brother Helvo Atius has had a dispute with Cyronin Sintav, that has caused bad blood between the Sintav and Atius clans. Astinia wakes up at 6am to eat on her main floor for two hours. On weekdays, she then heads to the Market District to wander until midday. At midday she goes to the Feed Bag to eat lunch for two hours. After this, on Morndas and Middas she heads to the Arboretum for three hours before heading home. On Fredas, rather than go to the Arboretum, she goes to the Temple of the One to worship for four hours before heading home. On Tirdas and Turdas she heads home right after lunch, and on the weekends she doesn't even make it out the door. She goes to bed at midnight every night. Astinia was also intended to play a role in the unfinished "Imperial Couriers" quest; at midday on the 11th of each month, as long as Emfrid is still alive, she will head to the Black Horse Courier and stay there for a brief moment before she resumes her usual schedule. Astinia wears a middle-class outfit consisting of a russet felt outfit and a pair of pigskin shoes. She carries a spare pair of tan linens, the key to her house, as well as a small amount of gold. The first time you approach Astinia, and 20% of the time thereafter, she will greet you with, "Astinia Atius. I want no part of the Sintav-Atius squabbles. I mind my own business." When asked about the Imperial City, she will tell you, "I'm fed up with the senseless feuding, blood spilled for no good reason. Glad the Watch put a stop to it." This page was last modified on 25 March 2018, at 02:40.